Today’s post was written by Nicole Silva, a registered dietitian. The key to success in achieving and maintaining your healthy weight is simple ... snacking. I know, you never would have guessed that...but it's true. Three meals a day (even three healthy meals a day) are great ... but you will inevitably find yourself hungry a few hours later and heading to the vending machine. I suggest eating every 3-4 hour to keeps your metabolism running and help maintain your blood sugar (preventing the rapid spikes and drops that cause you to feel ravenous). So be prepared, aim for snacks between 150-200 calories and have these treats handy! 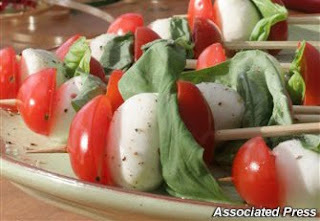 Fresh Mozzarella and Tomatoes: 1 oz of fresh mozzarella has just 70 calories. Pair 2 oz with 10 grape tomatoes and you have a filling, 170 calorie snack! 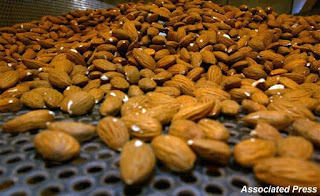 Almonds and Fruit: I'm being a bit vague by saying fruit because there are a myriad of fruit options to pair with your almonds. Half a serving of almonds (approximately 12 almonds) and an apple are one of my favorite snacks and just 160 calories. Insert your favorite fruit and enjoy! Sweet and salty = a perfect combination. English muffin and Nut Butter: There is nothing better than a snack that feels more like a meal. An English muffin is a great way to enjoy a mini-sandwich. I like Trader Joe's whole-wheat English Muffins, but any whole -wheat version is a great choice. Paired with 1 tablespoon of your favorite nut butter (unless it's Better'n Peanut Butter then you can have two tablespoons!) and enjoy a delicious 200 calorie treat. Laughing Cow and Wheat Thins Flatbreads : Laughing Cow cheese is to die for and just 35-50 calories per wedge. Spread a little on some Wheat Thins Flatbreads and you are set to go! Two flatbreads have just 60 calories--so go ahead and have 3 or 4. One wedge of cheese goes a long way--I swear! Popcorn: Popcorn is one of the best snacks ever—it is high in volume, low in calories and high in fiber--provided you choose the right variety (sorry, movie popcorn is not an option). I love the mini bags by Orville Redenbacher or Jolly Time. Both companies sell 100-calorie bags in two flavors--butter and kettle corn. I'm a sweet and salty kind of gal so I love the kettle corn--but both are delicious. So get your snack on and keep your focus! This entry was posted by kate, on Monday, March 22, 2010. You can leave your response .